Tastecard have added Beefeater to their list of restaurants and they give you 2 for 1 for all courses 7 days a week. You can get 2 for 1 at 169 Beefeater restaurants: Beefeater first fired up the grill in 1974, opening their doors to The Halfway House in Enfield. 40 years on, they can now boast over 160 restaurants nationwide. The combination of great steak, friendly service and relaxed surroundings first made Beefeater a big hit in Britain in the 1970’s, 1980’s and 1990’s, and today is no different. Their customers continue to tell them that it's their local smiling team members that make them return time after time. Steak has always been and still is one of Britain’s most popular dishes and no one is better placed to serve the nation than Beefeater, who serve over 12 million customers every year. Today Beefeater continue to hold a place in British hearts, serving up great tasting quality steak yet priding themselves on a wide affordable menu from succulent chicken and fish to fresh salads and indulgent puddings, catering well to a variety of tastes and appetites. Everyone is welcome, be it for a big birthday celebration, a relaxed lunch or a quick drink – and regardless of the occasion, tastecard members can be assured of great British food and a welcoming smile. Hopefully it’ll be the same on meerkat meals as it’s powered and run by tastecard, although just checked and not on there at the moment. Please Note: 1. The tastecard restaurant deals entitle the holder to 2 for 1 on all courses (Starters, Mains, Puddings) from the main restaurant food menu (excluding Sharers, Sides, Sauces & Upgrades) upon presentation of a valid tastecard. 2. Only one card per party is redeemable. The maximum party size is six. A Minimum purchase of two main meals is required. The tastecard must be shown to server when ordering and presented when bill requested. The cheapest menu item selected per course will be free. Drinks are not included in this offer and will be charged at full price 3. Mother's Day Set Menu, Sunday Lunch Menu, Daytime Saver Menu, Evening Value Menu, Breakfast and the Premier Inn Meal Deal are excluded from the offer. 4. the 2 for 1 restaurant deals cannot be used with any other offer, promotion or voucher, including the Whitbread Privilege card. 5. The restaurant offers cannot be exchanged for cash, they are non-transferable and must not be reproduced or copied. 6. All rights remain with the promoter who reserves the right to withdraw the offer at any time and without prior notice. The decision of the manager is final. does this apply to saver menu too ? Thanks. I get this card through NatWest silver account saves me loads per year and pays for the account in itself plus the other benefits I get. For up to 6 people as well (rather than the usual 2). This is a brilliant deal - trial £1 for 60 days ( remember to cancel ) or they have an offer for £4.99 per month instead of £6.99. You can pay annually for £34.99. Please Note: 1. The tastecard restaurant deals entitle the holder to 2 for …Please Note: 1. The tastecard restaurant deals entitle the holder to 2 for 1 on all courses (Starters, Mains, Puddings) from the main restaurant food menu (excluding Sharers, Sides, Sauces & Upgrades) upon presentation of a valid tastecard. 2. Only one card per party is redeemable. The maximum party size is six. A Minimum purchase of two main meals is required. The tastecard must be shown to server when ordering and presented when bill requested. The cheapest menu item selected per course will be free. Drinks are not included in this offer and will be charged at full price 3. Mother's Day Set Menu, Sunday Lunch Menu, Daytime Saver Menu, Evening Value Menu, Breakfast and the Premier Inn Meal Deal are excluded from the offer. 4. the 2 for 1 restaurant deals cannot be used with any other offer, promotion or voucher, including the Whitbread Privilege card. 5. The restaurant offers cannot be exchanged for cash, they are non-transferable and must not be reproduced or copied. 6. All rights remain with the promoter who reserves the right to withdraw the offer at any time and without prior notice. The decision of the manager is final. These cards amazing value and there are loads of places that accept them. I understand the offer is for up to 6 people but if there are 3 people how does that work? if it's buy 2 meals and pay for 1 what happens if you order 3 meals??? I understand the offer is for up to 6 people but if there are 3 people how …I understand the offer is for up to 6 people but if there are 3 people how does that work? if it's buy 2 meals and pay for 1 what happens if you order 3 meals??? I've got a tastcard membership, and I have to say the best thing about them is the cinema ticket discount. If you visit the cinema frequently then you save around 40% per ticket. Other than that if you eat out at their 241 restaurants during the week then it is also good. Thanks for this. We have a Beefeater just around the corner and saved me £15 last night. Whats the £10 reduced from £20 about then? how did you get 90 days instead of 60 days? How did you get a 90 day trial? I get this card through NatWest silver account saves me loads per year and …I get this card through NatWest silver account saves me loads per year and pays for the account in itself plus the other benefits I get. It’s a very good deal, I used it last night 2 for 1..
Hopefully it’ll be the same on meerkat meals as it’s powered and run by tas …Hopefully it’ll be the same on meerkat meals as it’s powered and run by tastecard, although just checked and not on there at the moment. One can only hope. I love Beefeater but not their crazy prices. I've got a tastcard membership, and I have to say the best thing about …I've got a tastcard membership, and I have to say the best thing about them is the cinema ticket discount. If you visit the cinema frequently then you save around 40% per ticket. Other than that if you eat out at their 241 restaurants during the week then it is also good. Is this a 1) 'show the card at the counter' or is it an app to get a code and then either 2) 'use the code at the counter' or 3) 'use the code on the cinema's website'? Once restaurant staff know you are using this they put wee in your food. Is this a 1) 'show the card at the counter' or is it an app to get a code …Is this a 1) 'show the card at the counter' or is it an app to get a code and then either 2) 'use the code at the counter' or 3) 'use the code on the cinema's website'? When you use the card in restaurants you present the card upon paying the bill (physical or the app virtual card). When you sign up, you get a physical card sent to you in the post. However …When you sign up, you get a physical card sent to you in the post. However you can also download the Tastecard app and use the virtual card in the app immediately. Example:[Image] When you use the card in restaurants you present the card upon paying the bill (physical or the app virtual card).With cinemas you need to login to the Tastecard+ website using your membership details and purchase tickets at a discounted rate prior to going to the cinema or take your prepurchased vouchers to the cinema to redeem at the counter. See below:[Image] [Image] [Image] Hope that helps. Thanks. I appreciate the effort. The main reason I ask is that some of the schemes generate codes so that you can type them into the cinema's website, e.g. Vue, and then choose your seat in advance, whereas others need you to go to the cinema early when its busy so that you can buy when you're there. Thanks. I appreciate the effort. The main reason I ask is that some of …Thanks. I appreciate the effort. The main reason I ask is that some of the schemes generate codes so that you can type them into the cinema's website, e.g. Vue, and then choose your seat in advance, whereas others need you to go to the cinema early when its busy so that you can buy when you're there. It all depends on the cinema. If the cinema does designated seating, which most cinemas that I have visited recently do, then you select the seats upon booking online. If you go in person then there is no guarantee that you will get your desired seats. 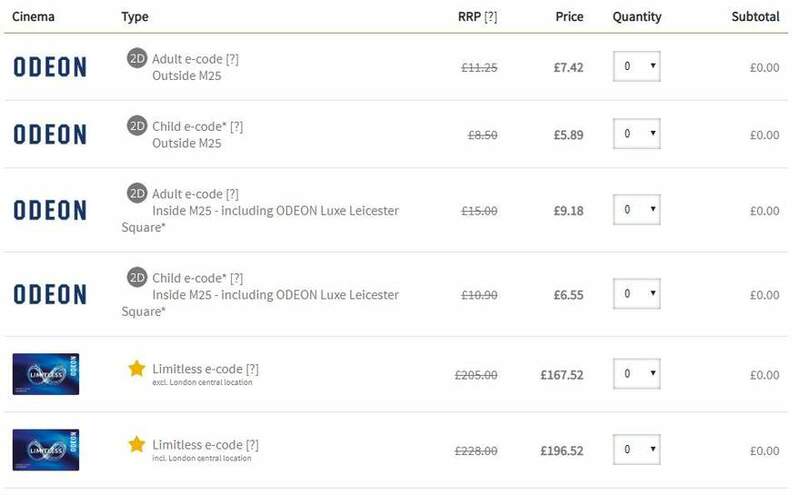 Odeon,VUE and cineworld are local to me and all require you to allocate your seats when booking online. It all depends on the cinema. If the cinema does designated seating, which …It all depends on the cinema. If the cinema does designated seating, which most cinemas that I have visited recently do, then you select the seats upon booking online. If you go in person then there is no guarantee that you will get your desired seats.Odeon,VUE and cineworld are local to me and all require you to allocate your seats when booking online. I see. The scheme I was with used to generate one type of e-code that could not be used online at the Vue website (only at the cinema itself). Later on, it generated a second type of e-code which could. 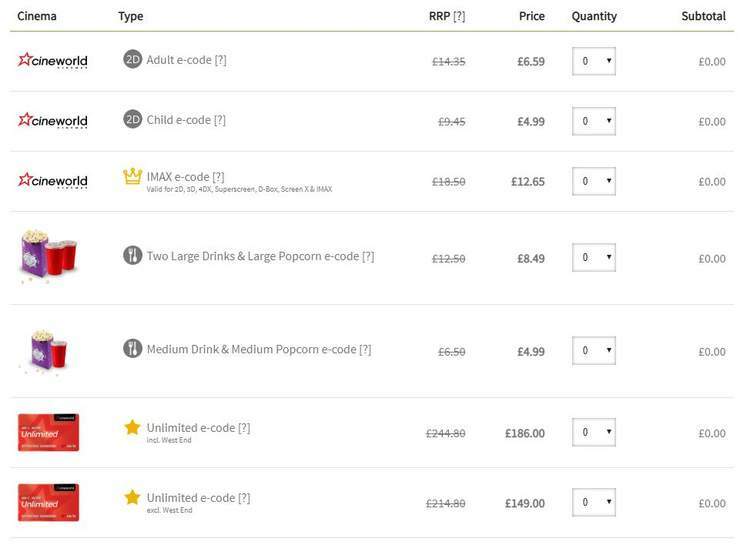 For example, when Nectar did their summer promotion with Vue, it gives you e-codes to type into the website. The first type used to be rubbish as you had to hand over codes to the till operator who had to type the lengthy code into their tills and you couldn't book online to get the seat you wanted way in advance (important when its a new film / busy evening). I see. The scheme I was with used to generate one type of e-code that …I see. The scheme I was with used to generate one type of e-code that could not be used online at the Vue website (only at the cinema itself). Later on, it generated a second type of e-code which could.For example, when Nectar did their summer promotion with Vue, it gives you e-codes to type into the website.The first type used to be rubbish as you had to hand over codes to the till operator who had to type the lengthy code into their tills and you couldn't book online to get the seat you wanted way in advance (important when its a new film / busy evening). No this is very straight forward. It works like a gift code or promo code when booking online. Are these the approximate rates you get?